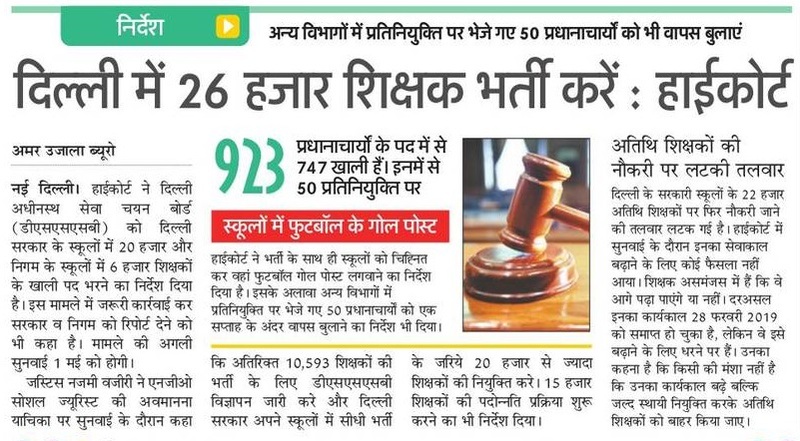 DSSSB Teacher Recruitment 2019 Delhi High Court has given order to fill DSSSB 26,000 vacancy 2019 in Delhi Government School 20,000 Teacher Recruitment and Delhi Nagar Nigam 6000 Teacher Recruitment 2019. Delhi Adhinasth Sewa Chayan Board has taken and given responsibility to fill all subject wise vacancy in Delhi Govt School. In next posts we will write about Delhi School Principal Recruitment 2019 which has more than 923 posts to be filled. So now onwards we will write about all words which are given in Hindi News paper cutting. 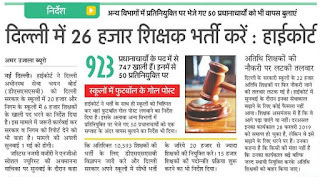 Delhi High Court Teacher Case 2019: Latest News 13 April One of Senior Judge in Delhi High Court asked 26,000 vacancy lists according to school and North, South, East and West Municipal Corporation Teacher Recruitment 2019. Delhi High Court next hearing date is on 1st May 2019. DSSSB Latest News 2019: Justice Nazmi Vajiri who is hearing case on Contempt filled under NGO Social Jurist Said," DSSSB should make 10593 Posts advertisement issued by Delhi Sub Ordinate Board and Rest of 20,000 vacancy should be filled by Delhi Government School. Delhi Government School Teacher Promotion: Latest News 13 April Total 15,000 Teacher Promotion Status soon uploaded on all govt school list with name HE/SHE Teachers according to work, Seniority and departmental exam or degree up gradation. Total Number of Vacancies: – 26000 Posts. Delhi Nagar Nigam: 6,000 Posts. Delhi Teacher Recruitment 2019: Latest News In 1st Stage 10593 Teacher Bharti is Starting & Rest of vacancy may be soon uploaded Job Category of Upcoming Teacher Job Delhi.